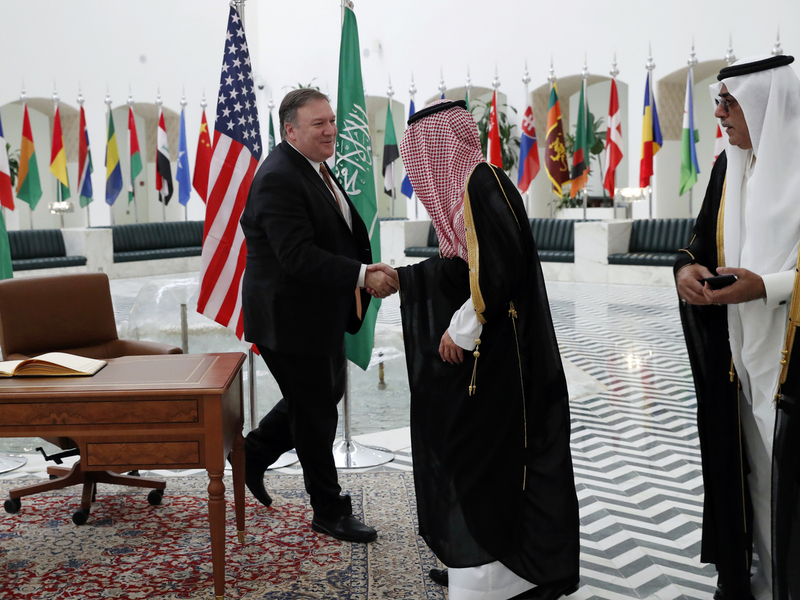 Pompeo Arrives In Saudi Arabia To Discuss Khashoggi Disappearance President Trump dispatched Secretary of State Mike Pompeo to the kingdom amid international tension over the disappearance of journalist Jamal Khashoggi. Secretary of State Mike Pompeo shakes hands with Saudi Foreign Minister Adel al-Jubeir in Riyadh, Saudi Arabia, on Tuesady. Secretary of State Mike Pompeo has arrived in Saudi Arabia after being dispatched by President Trump to meet with members of the royal court amid growing international tension over the disappearance of prominent Saudi journalist Jamal Khashoggi. Khashoggi, an outspoken critic of Saudi policy, has not been seen since he entered the Saudi Consulate in Istanbul two weeks ago. Pompeo met on Tuesday with King Salman bin Abdul-Aziz Al Saud in the Saudi capital and financial hub of Riyadh. Pompeo met later in the day with Foreign Minister Adel al-Jubeir and Crown Prince Mohammed bin Salman, dining with the prince in the evening. Tuesday night, Pompeo released a statement saying, "I emphasized the importance of conducting a thorough, transparent, and timely investigation, and the Saudi leadership pledged to deliver precisely on that." Pompeo said the leadership "strongly denied any knowledge" of what happened in the consulate. He also said "there is a serious commitment to determine all the facts and ensure accountability, including accountability for Saudi Arabia's senior leaders or senior officials." President Trump apparently phoned in while Pompeo was meeting with the crown prince. He said that the prince "totally denied any knowledge of what took place in their Turkish Consulate," and "told me that he has already started, and will rapidly expand, a full and complete investigation into this matter." The president concluded: "Answers will be forthcoming shortly." " 'Here we go again with you know you're guilty until proven innocent.' He is comparing it to allegations of sexual assault leveled against now-Supreme Court Justice Brett Kavanaugh during his confirmation hearing." The Turkish government alleges that Khashoggi was murdered by Saudi agents — a charge the Saudis have denied. However, The New York Times and CNN report that the kingdom is preparing to acknowledge in an official report that he died during a botched interrogation. Both the Times and CNN caution that the details of the Saudi's report, based on tips from anonymous sources familiar with the Saudi investigation, could change. A Turkish paper has alleged that a team of 15 Saudi men flew into Istanbul on Oct. 2, hours before Khashoggi was last seen entering the consulate, describing the men as an assassination squad. On Tuesday, Turkish investigators searched the consulate building. Reuters reports the team conducted a nine-hour search of the premises, and left with evidence, including soil samples. Trump told reporters on Monday that he spoke with the Saudi king, who has "firmly denied" any knowledge of Khashoggi's whereabouts. "I don't want to get into his mind — but it sounded to me like maybe these could have been rogue killers," the president said. "Who knows? We're going to try getting to the bottom of it very soon. But his was a flat denial." The remarks were a departure from what the president said during an interview with CBS' 60 Minutes last week, when he threatened the kingdom with "severe punishment" if it turned out that Khashoggi had been murdered. On Monday, Trump tweeted that he was sending Pompeo to meet with King Salman in an effort to "find an answer." Khashoggi's disappearance has caused U.S.-based companies, including Uber, JPMorgan Chase and Google — which planned this year to build five innovation hubs in Saudi Arabia — to pull out of a high-profile investment summit in Riyadh scheduled for later this month. The cancellations are a blow to the government, which has tried to market itself as an open, innovative place to invest and do business. On Friday, Treasury Secretary Steve Mnuchin told reporters he still plans to attend the Riyadh investment summit; however, the president said Monday it was possible the U.S. would not attend, but that no decision had been as yet.